Do you know about Open Square? We are a mixed-use community of about 40 businesses. Our tenants include an Aveda Concept hair salon and spa, a bridal studio, an event venue, environmental consultants (there are two links back there), medical billing experts, a solar company (offices and warehouse), a ballet academy, a software company (I asked Rob to explain the computer programs he and his company writes and I honestly didn’t understand his answer because I don’t speak Code) and a couple lawyers. Two Open Square tenants tie for the longest-term: Massachusetts Academy of Ballet and Enchanted Circle Theater. They have both been at Open Square for over 15 of our 17 years. Our newest tenant is Birthday Wishes, a company that puts together birthday parties for kids in homeless shelters. I am serious. There is a non-profit that does that. Every day at Open Square is a balance between two strong (and largely opposite) types of work: the dreaming and the doing. We are romantic realists. We are both pie in the sky and bottom line. Both excessively idealistic and ridiculously down to earth. We are romantics by nature. Year after year, that’s the explanation for why we do this. Where others see an entire city block of brick, we see possibility. 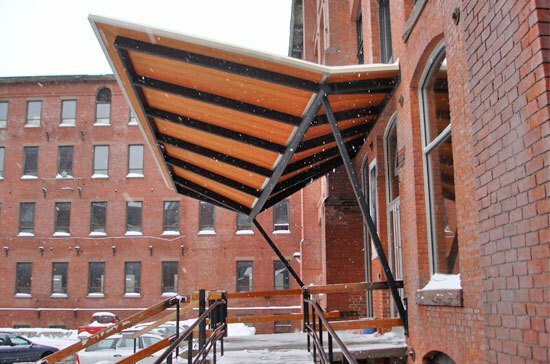 Open Square sees curved walls and sandblasted beams, a hotel, a charter school, a community of businesses, a hub of lunch munching over the canal. We need to be realists too because sometimes we bite things off and start to chew and then a toilet needs plunging or a delivery needs receiving or a tenant has accidentally locked themselves out of their office. Nonetheless, our small crew crosses off an amazing amount of ‘to do’ items. Open Square’s immense possibility lies partly in its scope. Simply put: Open Square is enormous. Yuge. There’s a lot to do. As proof, everyone working here loses 5 pounds in the first month from all the walking. Sadly that condition wasn’t permanent for me. I feel lucky to spend time in a building with such nice people doing such interesting and life-bettering things. If you’re ever in the market for office, studio, event, retail or warehouse space, I hope you’ll think of us.